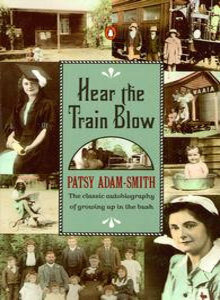 In our era of affluenza and intensive navel-gazing, its useful to occasionally put our spoilt lives into historical and real perspective by reading a book like Patsy Adam-Smith’s autobiography of her itinerant childhood in rural Victoria. It traces her early life as the daughter of a railway fettler and station mistress who moved constantly during the Great Depression, with stints in many small railway outposts. Work was physically hard, technology was basic, domestic chores were unmechanised, pleasures were simple and fulfilling, and family life close-knit. As the author says in her introduction “…we, the ‘respectable poor’, lived through the worst of times, the best of times”. Hard to believe that this world existed within living memory. It’s a really engaging story, in every sense. As a restless adult, Adam-Smith later went to sea, as they say, and wrote books of memoir: ‘Moonbird People’ and ‘There Was a Ship’, which I haven’t yet read. But I do also recommend her classic ‘The Anzacs’ as compulsory reading for its insights into that increasingly-sacrosanct legend. Stamp out omphaloskepsis before it’s too late.